The history of Grimoire De Occulte goes back to the very beginning of this decade. Bernd, the guy involved as drummer in bands like Nacht or Lost, and the same person who runs the Dunkelheit Produktionen label, created this outfit to focus more deeply on aspects like occultism, afterlife, dreamworlds and rituals. In the early years, Bernd, aka Baal, used to be the sole member of Grimoire De Occulte, and the first demonstrational recording was done by him exclusively. This solo-outfit was like a translation of Baal’s dreams, canalised into an aural form to express the feelings, ideas and visions from those dream states. But soon he was joined by two befriended musicians, being vocalist Philosoph and guitar player Viator Noctis (whom you might know, by the way, from Ius Talionis). Anyway, throughout the past decade, Grimoire De Occulte recorded and released a couple of demos / rehearsals, especially on tape and digitally, and the split with Peru-based Funeral Doom act Mirthless on vinyl (via Dunkelheit Produktionen, evidently) was like the start to arise from the unknown. No, the band did not want to leave the Underground, yet that 7”EP was sort of a milestone to escape from unfamiliarity. In Autumn 2017, the trio wrote and recorded the basement for their first full length studio album, and the result got mixed and mastered shortly after by Mario Dahmen (the guy involved with Babylon Asleep) at the Liquid Aether Audio studio. It resulted in three quarters of, well, I come back to this immediately. Besides the digital format, the material is available as well on compact disc (including a poster), on vinyl (12”LP; three different versions, also with a poster included) and on cassette (once again, with poster). And purely informative, yet the lyrics are in English especially, with German adaptations (and hey, it does fit well, cf. a piece like Death (Necromantic Spell And Elder Rituals)) and even Latin verses. Wisdom Of The Dead consists of five lengthy tracks (four of them clocking around nine minutes), yet the album opens with a nameless intro. And that one, well, impresses indeed for it offers a rich bunch of elements: wind bells, chimes, triangle, (church) bells ang gongs as percussion, hypnotic strings and floating synths, and a cold narrative voice, all mingled into one (short) introduction. But the ‘core’ story of Grimoire De Occulte starts as from Below The Ground. A first impression, each time again, brings names like Delirium, Asphyx or even Torchure to mind. But hey, let’s not go too fast. The album is a collection of extremely low-tuned and slow, megalithic heavy and oppressive (Death) Metal, totally rooted in the Old School tradition. Below The Ground brings forth a monumental melodic opening riff, joined by low-tuned rhythm strings, slowly pounding drum patterns (which do remind me of some mixture of, let’s say, Delirium and Necro Schizma), and eerie, deep grunts. After a short while, things speed up – but pay attention, for ‘speed’ is not ‘speed’ as in ‘speed’, yet rather the brutal energy that did also characterise the earliest years of Samael. Indeed, that kind of ‘speed’. That acceleration passes by quite soon, and here it is: the essence of this kind of Metal Of Death, being harsh, lo-fi (once again, not in a negative sense! ), forceful and, especially, enormously obscure and oppressive. Rather simplistic leads and riffs (no technical or progressive experimentation, yet the core of ‘true’ Death Metal glory) are heavily supported by that gargantuan rhythm section, and in a hypnotic way, the rhythm and bass guitars take away your spirit to a secret dimension. Besides, there is a fine dose of modestly divided variation (tempo, as mentioned, yet as well when talking about song structures and self-repeating chapters within each track). That diversity is ‘modest’, which does not refer to sudden breaks or unexpected loops, yet to a necessary balance to strengthen the endurance of these quite lengthy compositions. 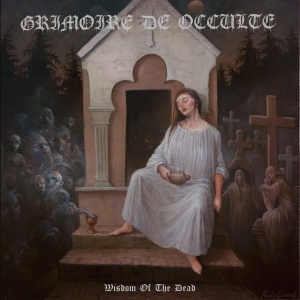 This goes for all tracks on Wisdom Of The Dead, being based on a colossal layer of Doom and Death Metal, penetrated by some faster excerpts, and carried the whole of the time by a well-balanced equilibrium of melodic craftsmanship (the mesmerizing way) and persuaded rhythmic power, covered in a veil of occult and obscure drama. It is like growing ‘from the fire of enlightenment’, ‘a materialization of collective energies’ canalised into forty-three minutes of ritual / spiritual yet massive Aural Art. Do not expect to experience a renewing album. No, Grimoire De Occulte do not have the intention to reinvent hot water, or the wheel. Yet then again, I think they are unique, for this specific approach is underestimated, and not sufficiently promoted and supported. That’s a pity, but with bands like this one that specific niche might get the attention it deserves. For what it is worth, but I appreciate, and adore, this official full-length debut of this German act! Come… Arise…!